Whenever we come across a film directed by a woman (which is few and far between), we tend to have preconceived notions that it would either be a mouthpiece for their gender's upliftment or a soft mushy romance story. 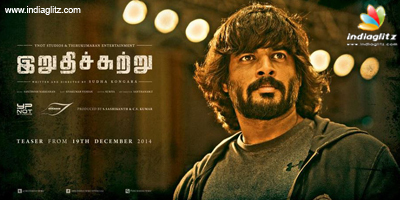 However with ‘Irudhi Suttru’ Sudha Kongara takes the viewer completely by surprise with her sports drama riding on a love story told in a raw manner which makes for a pleasurable and emotionally moving viewing experience. 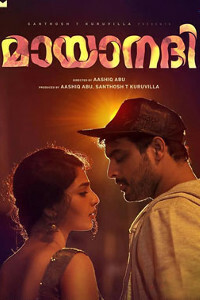 Madhavan plays Prabhu a hot headed national boxing coach who as punishment for not bowing to the higher authorities is sent to Chennai with a challenge to discover and train a woman boxer for the National Championship. 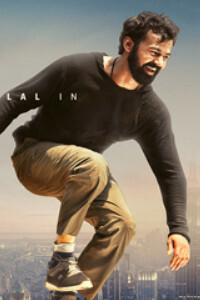 Prabhu lands in the North Chennai region where Nassar is the bungling trainer pinning his hopes on his student Lux (Mumtaz Sorcar). Madhee (Rithika Singh) is Lux’s sister who sells stolen fish and has a spirit like a wild horse. Prabhu sees a world level boxer in Madhee who is totally not interested but agrees to train for the bribe of Rs.500 a day the coach offers. The rest of the story is about whether the failed coach succeeds in training a mere fisherwoman into a world champion. Rithika Singh as the firebrand Madhee scorches the screen in every frame of the film and is easily the number one contender for many an award this year. Rithika's posture and body language is literally that of a tigress when showing her attitude or when fighting but then she is all tenderness when she falls in love with Maddy and every time he rejects her. Not to forget she looks fetching in the one scene she appears in saree to impress her man. It is not an exaggeration to say that she receives the thunderous applause of a mass hero every time she scores. A Red Carpet Welcome to this talented youngster. Maddy the ever loveable chocolate boy has completely transformed into the washed out boxing coach Prabhu with a troubled past. Kudos to him for dedicating close to three years for the role and more so for letting the heroine hog the limelight. The way Maddy underplays his role is what elevates Rithika's and the duet of emotions between the two lingers long after the film is over. Maddy does deliver his knockout punch in the climax when tears well up in his eyes for the first time after maintaining an emotionless demeanour until then. The chameleon Nassar this time assumes the color of a local coach and needless to say lives the role delivering laughs at regular intervals, especially the liver comedy in the liquor shop brings the house down. Kaali Venkat plays the father of two grown up girls and he ensures laughter in all the five or six scenes he appears. Mumtaz Sorcar as the sibling who places her career before her sister and later repents is excellent and so is the entire cast from the mother of the girls to the ever dependable Radha Ravi. Zakeer Hussain as Dev the head of the boxing board is the usual villain who lusts for the girl and tries to disrupt the hero from winning. 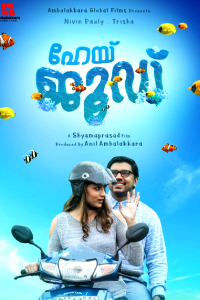 Santhosh Narayanan’s music score is mind blowing and all the songs are set to convey the different moods and emotions which they do convincingly. Sivakumar Vijayan’s cinematography and Sathish Suriya's editing are top notch. 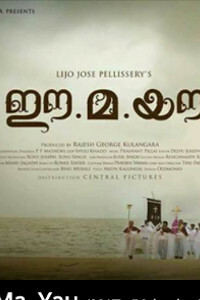 C.V. Kumar and Sashikanth can be proud of producing this gem. Sudha Kongara deserves every praise that comes her way for writing and directing ‘Irudhi Suttru’ (R Madhavan and Rajkumar Hirani are credited with additional screenplay). Sudha conveys Maddy’s weakness for women and his passion for boxing in less than thirty seconds in the opening scene proving her grip on the medium. Her hard work is evident by getting Rithika and Mumtaz two non Tamil speakers to get the perfect lip movements and body language which makes them easily acceptable to the audiences. 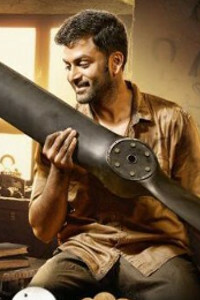 The local flavour of North Chennai is captured well enough to rival the likes of Vetrimaaran and Ranjith. The training scenes are so realistic that the audience begin to feel the strain and that is credit to the maker. Every sportsman has a driving force that takes him to victory and for the reluctant Mathee it is her love for the older man which is convincingly told. The second half lags a bit which is easily forgiven when it leads to the riveting climax when we are enlightened about the feats of Indian Women Boxers.